Terry, Kate (1844-1924): Kate was the oldest of the Terry children. She played Prince Arthur in King John so effectively that Queen Victoria ordered a Command Performance. She and her sister were hits in Brough’s extravaganza, Perseus and Andromeda (1861). She played many Shakespearian roles. 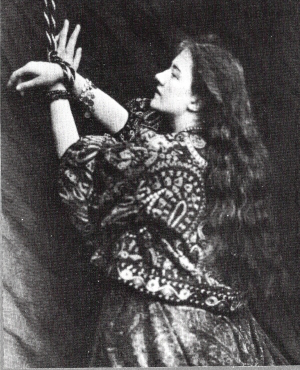 In June 1867, she starred in Dora, by Charles Reade (based on Lord Tennyson's poem), and, in July, she played Beatrice in Much Ado about Nothing. She bade farewell to the West End in the title role of Romeo and Juliet. She was only 22.